Slike su Vam fantastine. Dugo, dugo nisam vidio tako upeatljivu zkribu.Razmislite o tome da napravite jednu (ili vie) Windows 7/8 Desktop Background Themes za sada ne postoji ni jedna hrvatska zbirka! A ni dodatna reklama ne bi bila na tetu.BTW, your English is impressively clean and fluent, too. Have you seen any shows if so, which? Worked on all of them.What did you think? Continue to be amazed at the level of tanelt in the cast and in the writing team. Well done everyone. Dot, Glenn, Dean fantastic.Any other comments? Anyone who hasn't got a ticket what a show you'll miss!! is a generater bilcasy a small engine with an alternater mounted on the crank shaft?how does a generater put out enough energy to power a house but an alternater in a car only creates enough power to charge the battery.is it just a bigger alternater or is it not an alternater at all.if not what is it and how does it work. You've got the basics right. It is an egnine with an alternator attached. The alternator in your car is a small unit with diodes which convert the voltage from AC to DC to charge the battery. A generator which will power a house is considerably larger and doesn't convert the voltage to DC. Power plants which produce enough to run a town also use generators, huge generators. Al was a Pioneer... A Legend.... A True Football Owner/Fan/1 Of A Kind. Al You Will Be Missed... Just wont be the same not seeing you on the sideline's. R.I.P. Brother " Give'em Hell " & Just Win Baby !!! I'm 51 and I've been the RAIDERS since I was just a kid. 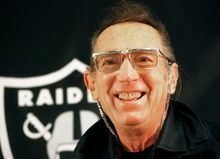 Al is the reason I fell in love with the Raiders, Al Davis' Raider way of playing the game and those great uniforms. There's a big hole in my stomach that will always be there, even their latest win on Sunday, I'm just numb. I'm just a fan from MN But I just wish I could've met Al. God please be with Al's family and true friends. 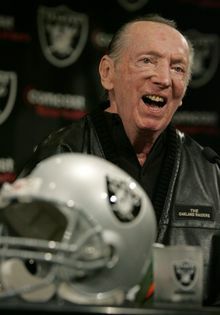 I will always love Al Davis and the OAKLAND RAIDERS. He gave me the best Job of my Lie!T be able to be down on the field was and watch the talent all those years. The woman I cheered with will forever be in my life and we are there for each other .One time when i ws doing a promo he was in the office he said hi ya going out and working I said I cant wait. He said make continue to makeus proud. With out him bring woman into the nfl there would have no Raiderettes and I would not have the life and love I have now. So Thank you Mr.Davis for caring and loving us! RIParidise for you!! Silver and Black forever! I am a Raider to the heart, just like Al. Raiders today and forever. IT'S LIKE LOSING A FRIEND. NO TEAM WAS IDENTIFIED BY A SINGLE MAN MORE THAN AL DAVIS AND THE RAIDERS. JUST WIN BABY. Al, may u rest in peace.. thank you for the Oakland Raiders and everything that you accomplished being in the NFL. You will never be forgotten.. Raider Nation!! Always will be Silver&Black..Just win baby! Thanks Al for all the Memories. When you get to Heavens Door, I hope you Just Win Baby. I lived in Los Angeles most of my life. I had season tickets to the Los Angeles Raiders for 8 yrs, lots of memories and lots of fun. I moved to Ark the year my beloved boys moved back to Oakland. Al you will be missed Your family and the boys are in my prayers and thoughts. I know you saw Sundays game. "JUST WIN BABY" is right, and win they did. God Bless to you all, stuck in Ark missing Cali and Raiders. I can remember watching the "Immaculate Reception" live on tv with big brother Willie. The raiders lost that game. I vowed from that day forward..that team in the Silver and Black should have won and that is favorite team.I was working in Monterey California, at The Sardine Factory and Al Davis came in for dinner. This was when they were in court in Salinas for the move to L.A. I went up to him and asked him for his autograph. He asked my name and asked me "Do you think I can move my team.? I said you're the owner you can move any where you want. He replied "Well maybe not anywhere I want, but I think we have a good case.". He wrote: To John a great Raider Fan Best wishes ..AL DAVIS. I will never forget that day. You are the Number one Raider fan..You will be missed by all!! Good bye Al it has been interesting watching your legacy, As a old friend and fan just have to say. U will be missed by the nation and family alike. I wish your family the best of luck keeping things in order, I know Al left u the people to make it easier for u.Good luck to u.
I HAVE A LOYAL RAIDER FAN FOR 48 YEARS AND I WILL BE A RAIDER FAN FOR THE REST OF MY LIFE. EVEN WHEN MY FRIENDS WERE CHANGING TEAMS I STUCK WITH THE RAIDER NATION, THROUGH THICK AND THIN EVEN WHEN WE WERE LOSING ALOT OF GAMES. MR DAVIS IS NOW IN RAIDER HEAVEN AND HIS DEATH WAS A MAJOR BLOW, I EVEN SHED A FEW TEARS WHEN I HEARD HE DIED. BUT GOD FINALLY CALLED HIM HOME AT LAST. MY HEART GOES OUT TO HIS BELOVED WIFE AND HIS SON AND ALL THE PEOPLE IN RAIDERNATION. THANK YOU FOR DAVIS FOR ALL YOU HAVE DONE. 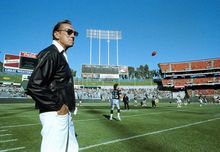 Al Davis will be in Raider fan hearts 4 ever.Without Al Davis there will be no NFL and RAIDERS. THANK U AL FOR RAIDERS*. We Bleed SILVER & BLACK. I was in the same Company the 91st Combat Engineers at Ft Belvoir Va. with Al Davis. Mr. Davis was the coach of a powerful football team there and one of his other duties was managing the post recreational facilities. My best buddy was a friend of Al Davis. We managed to get me assigned to the motor pool where we provided transport for Mr Davis needs. The one I enjoyed greatly was being assigned to a Radio jeep at the post football games. It's purpose was to provide instant contact for emergency needs either players or spectators. Mr Davis main concern was for the welfare playing or attending the game. Being assigned to the post swimming pool Mr. Davis managed for the same purpose was an eyeful. Picking up a carload of massive football players was a site to behold. I was thrilled when The Raiders were established in Oakland. I worked with neglected unwanted kids then and Mr Davis and the Raiders always provided a Christmas party for these kids with individual gifts. Mr Davis was always there and spent time with the Kids. Say what you want about Mr. Davis but I say he was a very caring person for others and looked out for their welfare. ~RIP~ May your iconic legend leave footprints on those left behind!